USB Debugging mode enabled is the most critical step in Android rooting process, which can only be done manually by users themselves. The latest Android version, i.e. Android 5.0 (Lollipop), has been released and rolled out to Nexus devices on 12 November, 2014. The Nexus lineups including Nexus 4, Nexus 5, Nexus 7 and Nexus 10 will receive OTA update shortly. And this article shows you how to enable USB Debugging mode on Android 5.0, the Lollipop. Google uses Material Design on Android 5.0 Lollipop, which adds fresh animations and new looks into its UI. However, the steps to enable USB Debugging mode stays the same as earlier Android versions above 4.2. 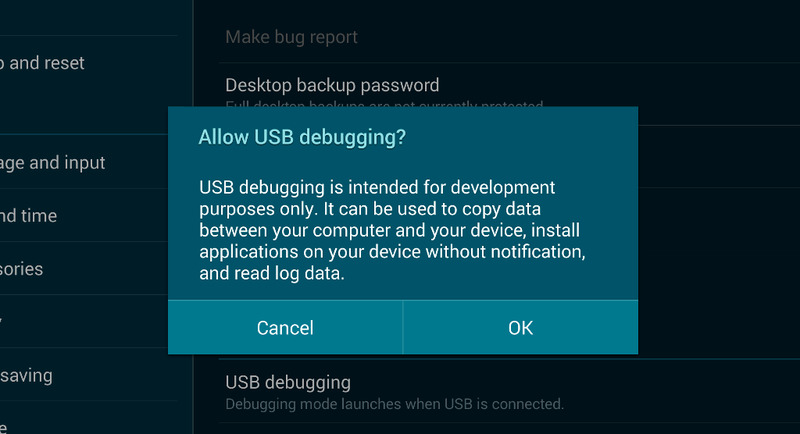 Step 5: Click to enable USB Debugging mode on Android 5.0 Lollipop. There will be an icon on the top left of your notification bar that suggesting USB Debugging is ON.